Jim, or "Col. William" as he was known in show business, was a colourful man, "one of the last of the old time medicine show men". He was a rebel who ran away to join the circus. He became a carnival performer and a "snake oil" salesman who was known to set up his stand on street corners to sell his elixirs. He was the black sheep of the family. 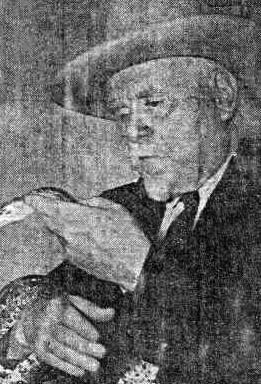 "As Col. Brown he was known to thousands of Canadians, and to more thousands he sold his snake oil.... Until the last, he was a showman. "His death caused considerable excitement and the circumstances surrounding it were as unusual as some of the stories he told in his spiel when a crowd gathered. In his bag he had a big snake but no one knew it and when he was admitted at the hospital a nurse opened the bag seeking for some identification and the snake popped its head out.... Almost the same thing happened in Col. Brown’s neat and tidy two-roomed home in Galt. A police sergeant and constable went there to look for a hidden store of money he was, by popular opinion, supposed to have. They started the search aware there might be a snake around but they didn’t spot it for a minute. They found it curled up on top of a box. It apparently was allowed the freedom of the house while the Colonel was away. "Colonel Brown, who was a striking figure in his 10-gallon hat, white goatee and mustache, was often called “a man of mystery.” He wore his hair long and flowing. 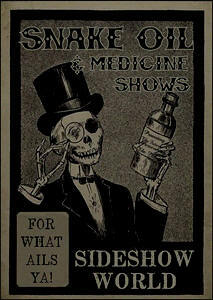 For years he had his own medicine show that travelled all over the continent. He travelled, too, with circuses and carnivals. The colonel, wherever he appeared, looked like a man who had just come from where the sweet magnolias blossom, every girl is a belle, a gentleman is “suh”. But he never saw the south, except with a medicine show. His had been a more rugged career. He was a member of the Canadian Mounted Rifles at the coronation of King Edward VII, he liked to recall, and before that he had fought in the Boer War, serving in the entire campaign. "He was, he admitted, the oldest pitchman still on the road. His snake oil liniment was guaranteed by him to help or cure corns, colds, coughs, drawn cords, sprains, asthma, catarrh, hay fever and rheumatism among other things. "He told interviewers that he was considered “the black sheep” of his family and he declined to give any of his family background. The colonel said he was a bachelor. His body was taken from here to Galt today. No one in either city seemed to know of any immediate relatives though it was reported that the colonel had a brother who was at one time chief of police in one of Canada’s largest cities."